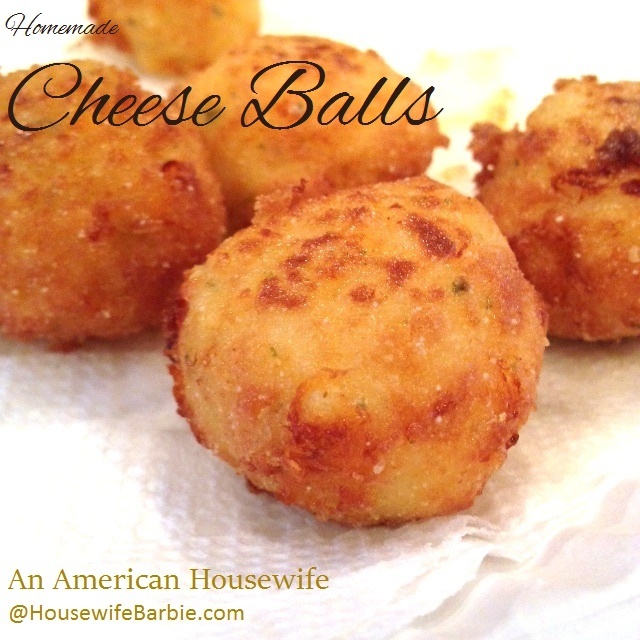 An American Housewife: Homemade Cheese Balls - Feta, Gouda, Cheddar... goodness! Homemade Cheese Balls - Feta, Gouda, Cheddar... goodness! Our family loves cheese. Once while having a conversation with a friend about cheese, I randomly went to the refrigerator to see how many different versions we had on hand at the time. Fourteen. Yes... 14. I don't typically buy cheese 'products' like Cheese Whiz or Velveeta so these were real cheese of all sorts. That's how much we love cheese! When I am in the mood for hot, melty and delicious cheese balls I don't actually follow any recipe and I use whatever mixture of cheese I have on hand. I've posted our 'go to' recipe on An American Housewife before, cheddar and lots of spicy jalapeno's! I usually add jalapenos and don't take new photos because frankly... they would look the same pretty much every time. But this time I didn't make them spicy so I decided to snap a couple new photos on my phone while i made them. Use the cheese you have on hand and adjust the amounts accordingly. If you don't have feta or gouda (or don't think you want to use them) just use a mixture of cheddar and mozzarella. Or just cheddar and cream cheese. I opted to dust them with a little additional flour with some panko crumbs mixed in so they are crispier, but you don't have to use panko if you don't have it. If you don't have self-rising flour, mix some up and keep it in an air tight container in your pantry. It's just a cup of regular flour with 2 t baking powder and 1/2 t salt mixed in. You'll use just less than 1/4 cup for this recipe. Mix the cheeses, egg, flour and season with a bit of pepper. You can opt to add a little garlic or spice it up with jalapenos if you wish. The mixture should be thick enough to hold together to form balls. Chill for about 30 minutes to make it easy to work with. Form little cheeseballs by hand or a small scoop. Gently roll and toss into the dusting flour/crumb mixture. At this point you can fry them or you can freeze them to fry later. I usually fry half and freeze the other half for later. Fry the cheeseballs in about 1-2 inches of hot oil until golden brown. If they brown right away, your oil is too hot and the inside won't be completely melted. Medium high heat, and it should take about 2 minutes. Drain on layers of paper towels. Don't crowd the pan - if they are crowded or the oil is not hot enough they won't be crispy, but will be soggy. You can season with a little salt if you wish.